Have you been hooked to the royal wedding all day? You may have seen newly-weds Harry and Meghan climb into this classic Jaguar E-Type and drive off to their wedding reception. That's not any classic E-Type though, it's the one-off Jaguar E-Type Zero, a vintage car with an electric heart. Enzo Ferrari called the original Jaguar E-Type 'the most beautiful car ever made', and guess what, at the end of last year Jaguar announced an electric version, 56 years after the original. 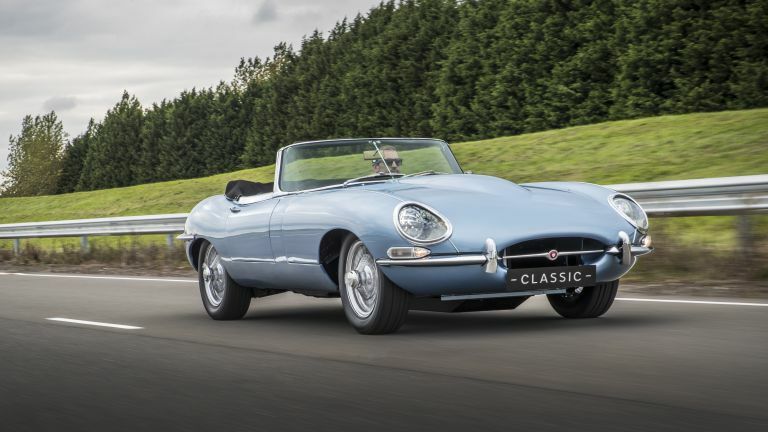 Called the Jaguar E-Type Zero, it's based on the 1968 Series 1.5 Roadster, but open up the bonnet and you find an electric 220kW motor and battery packs. This motor will be capable of launching the classic from 0 to 62mph in 5.5 seconds, with a top speed of 150 mph and a real world range of around 170 miles. Not much else has been changed. Peek inside the cabin and you'll find the original leather seats, large wooden steering wheel, although, the carbon fibre dash and touchscreen and rotary gear selector do belie it's modern underpinnings. For now the E-Type Zero remains a prototype vehicle, but there’s serious production intent if customer interest is strong enough. We seriously hope it does make it into production, but if it does one thing's for sure, it'll be expensive and rare.